Imagine, one day you are walking and you see a single Dandelion in a grassy field and wonder, “How did it get there?” One scenario is that the wind scattered it’s seed. Then, moisture activated endogenous enzymes to start respiration and ATP growth production and when the first little sprout uncoiled itself to the sun, chances are, this wasn’t noticed by you, or anyone. This marvel happens a trillion by a trillion times a day, silently, (humbly) without notice. Though modern life has disassociated many of us from such inquiries into nature, we rely on its success no less now than before. 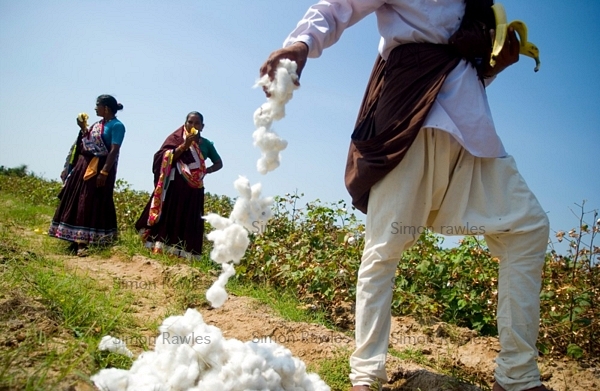 For a farmer in the Nirmar region of Madhya Pradesh India, planting cotton year after year, these inconspicuous moments begin a process of tending, hard work, survival and hope. Rajesh and his family farm lies 2 km east of the Narmada river in the Narmada Belt. Here the soil is rich black cotton soil called reguar. His father and his father before him, had success with cotton in this semi arid region. Before the onset of the kharif monsoon, they plant and then harvest their bolls in October. But, things are starting to change. Farmers like Rajesh, recognize a delicate balance of all the elements, and recognize an ebb and flow of uncertainty from year to year. They don’t perform a chart analysis of each year or understand agribusiness. They just plant, perhaps pray and have to accept what comes. Rajesh and his family learned by doing. He did not waste time on theories and he does not know how to market his product. The earth takes some back for itself. Sometimes the mole gets the potato and the aphid the leaf. There are things that are uncertain. In the past and still in many present cases, farmers lives were and are scaled to fit the conditions around them. Scale is an important concept in balance. If the teeter totter has more weight on one side than the other, the heavier side sinks. Advertising often trumps common sense and tradition. If a farmer who scrapes by barely from the sale of his crops wants to use an expensive new miracle seed, he can take out a loan secured by the farm. Now his overall fiscal health depends on an unpredictable future – good yields. Suddenly the added weight on the scale, such as the seed loan coupled with a bad season in sales, drops the teeter totter and much more yield is required to balance it. Sadly for Rajesh, like many of India’s farmers, the piranyhas of industry were setting out bait ready to sale the the fish their water. In post modern urban life everything is outsourced; Want food? Go to a restaurant. Feel sick? Go to a doctor. Trouble walking? Glide on moving floor panels and Segways. Then afterwards walk on a treadmill at the gym. Compare this lifestyle to Rajesh and his family in Madhya Pradesh and you will see that in their case, many things negotiate with other things directly for survival. Rajesh’s wife feeds the family cow and milks the cow. The cows dung is collected for fuel and fertilizer. The cows urine is used to make special fermented compost tea to feed soil organisms that will help grow the cotton. The cows milk is heated, the cream separated and collected and eventually made into ghee and paneer. The bull is used to plow the field. The bull eats fodder collected by the Rajesh’s teenage girls. His wife, sister, nephew, brother and father harvest the wheat. His wife and sister pound freshly harvested wheat to separate the grain from the chaff. The chaff goes to the goats. The grain is ground into a soft flour to make paranthas. The family eats dal and paranthas and work at the harvest with Rajesh. The littlest ones are left behind with Rajesh’s wife who watches them and pounds laundry made of cotton against smooth stones at the river. Everyone and everything has a role that is directly linked to the others survival. Everyone and everything is in a relational order, being once an eater to one day becoming the eaten. I do understand that nostalgic thinking or thinking we can or should all return to a subsistence interdependent life like that illustrated above is not currently possible and not even wanted. Most people have left the frost and the forest without the will, desire, or ability to return now. The problem is not the choice to willingly leave that life. It is that those who want to continue or return to the practicalities of such a life style are blocked by a dependency/inequality cycle that is not easily untangled. Or worse, they are driven from ancestral lands into cities to be cheap labor. The promises of trade agreements and agribusiness to give equal market access to farmers like Rajesh and pay them fairly has not materialized. The opposite is happening and millions are being displacement from their means of production through debt entrapment, land grabs and environmental destruction. At the very least farmers should be given time and education to make wise choices to acclimate to the ask of a global market economy. Instead, there is a global modernity/progress public relations skew that promotes entrapping technologies and methods against farming knowledge, food sovereignty and more agrarian and subsistence life styles. Rajesh and others like him are often pointed to as the reason for an industry created “scarcity” story that says he and other “third world” farmers simply can’t feed their people without the help of savior technologies like GE seeds (Genetically Engineered). Rajesh can’t scientifically test the organic processes that make up soil ecology. I’m doubtful he knows the periodic table of the elements. He’s not aware of all the genetic scientists in St. Louis busily following Monsanto’s mission. What he does know is that when certain plants show signs of sickness, he must burn them fast. His father showed him this. There are countless things not directly observable. For example, sick plants send infrared beacons that attract feeding insects. It is then the insect’s role to dispose of these plants and recycle them back to the earth. If a farmer has many any sick plants, a giant infrared target beacons to insects far and wide- come here! Plants with weakened immunity are quickly found. It’s hard to trick insects. You may make a plant resistant to one pest through genetic modification but eventually the infrared signalling will draw in more and more of other pests like the white fly. The biotech industry knows this. It is part of the business model. Let me explain. We have in our environment today many things that were there before we were born – gifts that more often than not we seldom take the time to notice or appreciate. One of these gifts is top soil which can take up to 500 years to form naturally. The delicate balance of erosion, composting, micoorganisms such as bacterial, algae, anthropods, fungi and their complex habitats all interact in mutually beneficial relationships. These relationships are hard to tease out. For years farmers trusted that nature knew how to generate nature, even when it wasn’t convenient. For example, seasonal floods would bring rich minerals to the soil in Rajesh’s valley and though the floods required pre-planning and a shift in living arrangements, the bounty of working with this free seasonal resource paid off in rich soil and big plants. Adaptive intelligence is visible all around us. Just like it has taken an accumulation of learning from birth to present day to know what we know, all of nature undergoes the same process. The cotton plants seed has such intelligence. Through successive generations of natural selection it has developed changes in its physical morphology to enable it to survive shifts in environmental conditions, on a micro and macro scale. However the cotton plant evolves according to its time table, not mans. We cannot know the totality of its intelligence is just by observing DNA, nor do we know subtle environmental shifts that shaped the seed. There are no weather records in this area of Madhya Pradesh, just human observation. The seed has a present day response to a late monsoon. Yes, the plant might grow slowly the first year but then successive generations may grow strong in dryer or late monsoon conditions. Agribusiness demands results on a human time line partially because modern human psychology sees itself as separate from the environment. This is a paradoxical luxury. On the one hand, our capacity to see ourselves separate from the environment and assign values disassociated from consequences is a product of more brain activity. We think abstractly. On the other hand, this thinking is like a dog chasing its tail. We create environmental problems that we then have to use our brains to solve. This takes alot more input and energy than working with nature. A deeper more interdependent relationship with the environment forces us to proliferate within natural boundaries where populations cannot exceed the carrying capacity of a given area of resources. If we design our activities around working with nature something interesting begins to happen – we have more of what we were afraid of losing – time, connection, vitality. 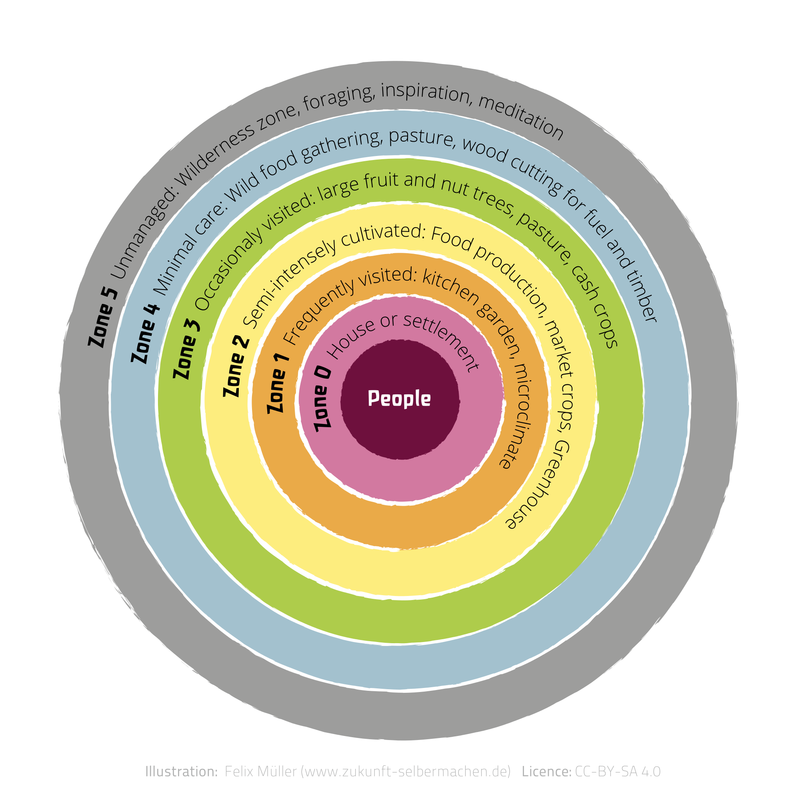 Take for instance the method of designing gardens and homesteads called permaculture zones. As the rungs go farther to the outside, there is less activity, travel, and inputs to maintain food production. This works with the length and requirements of the growing cycles of plants. This model also ensures that everything that dies or gives waste is used by something else to help it grow. Seeds are saved and used in the next planting. Waste and resources are managed as part of a long term vision. These are sustainable practices that attempt to replace resources that were used in the production of something in order to maximize the longevity of those resources. By contrast, in product development, there is a concept called “planned obsolescence.” This is an approximate end of life date created somewhere in the design or manufacturing process of a certain product. It ensures that a car for example, won’t run trouble-free for 10 years, or that a AA battery has to be replaced in your TV remote. In this case, you have to buy new parts, have regular service, and change the batteries. At each node, more money is exchanged for goods and services. Over successive generations of consumers exposed to this model, they come to accept that things have to be replaced. Therefore the possibility that technology exists that could replace inferior products that wear out, with ones that won’t, is sealed from their imaginations. The consumers demand less because they don’t know they can demand more. Genetically engineered crops are not designed to succeed long term. They don’t have to be. The company makes the profit, and then solutions are sold for the impending environmental disasters that proceed their technology. Things that last rarely go into mass production, because, it is..not…profitable. At present, few industries including the agricultural “industry”, deviate from this model. In agriculture however, the disposable product, food, has one problem. Farmers have been producing it without the help of technology for thousands of years. Seed saving, use of bio-wastes for fertilizing crops, planting in accordance with rainfall patterns, etc. all worked within the bounty and boundaries of environmental forces. So in order to introduce planned obsolescence into traditional farming, certain aspects of farming had to be separated from its supply of free renewable resources, to make sales. To do this, the farmer needed to become dependent on external goods and services. How is this done? 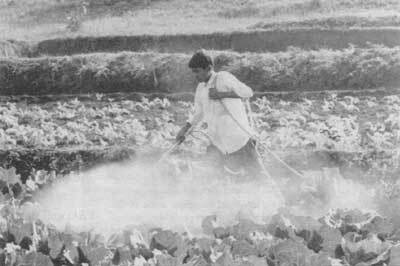 First soil fertility was destroyed with a wave of chemicals leftover from the stockpiles used for biological warfare in Vietnam. Plants then became weak, less nutritious, and susceptible to pests. The same weak plants were then grouped together in large mono crops away from diverse insect and weed buffers such as marigolds or nitrogen fixing legumes, and the plants struggled more. Of course sick plants send out signals to insects that say “recycle me”. Insects attacked. With less competition certain weeds proliferated and evolved to grow despite the chemicals. Boardrooms cheered. GE seeds with insecticide were patented and sold. Monarch butterflies started to die. Other seeds were sold. Super weeds began to grow. New releases of GE seeds came out. And the process continues. Unlike the 20th century where the human psyche was manipulated by advertising to “want” things for abstract reasons and reasons with false value, the 21st century stands to have our needs completely privatized – water, food, air. All of our needs are supplied by nature and have been since its creation. Privatization of resources, climate manipulation, and genetic modification is Man as his own entitled God and science as his method of justification. We simply don’t know what we don’t know, but playing with technologies that assume we do, spells disaster. Rajesh is worried. He sits looking at his field which is spotted with bronze colored wilting plants. Six years ago he heard news about the boll worm being a problem and destroying crops on the other side of the river. A poster plastered on the wall of a tea stall showed a picture of a nearby farmer having obtained, “20 quintals of yield per acre of BT Cotton!” Rajesh asked the other farmers what they thought, and by then, all of them were simply repeating poster bylines. Now he’s in trouble. He spent nearly all his family savings to buy miracle seeds that costs 300% more than those typically sold in town, not to mention he usually saved his seed from season to season. For three years his crops yielded higher than average with BT Cotton. The last two years however, some plants have died of root rot. Others had a strong vegetative growth and are flowering but then the leaves dry, wilt and turn bronze. This year the white flies are attacking. The plants are sick. Rajesh did not understand that BT Cotton seeds were not like other seeds. A seed looks like a seed. He knows nothing about genetic engineering. The technology nor the consequences are understood by the common farmer in India. And this is something Mayhco, Monsanto’s Indian subsidiary, depends on. BT Cotton requires three foreign genes to be inserted through genetic engineering: The Cry1AC gene which encodes for an insecticidal protein which is derived from Bacillus Thuringiensis, and two other genes are inserted by force into the cotton genome. This is done in a lab. When Rajesh took out his savings to buy the seeds he did not research the company he was buying seeds from. He doesn’t have a computer. Many bribes exchanged hands before Rajesh saw the advertising. Had he known the history of Monsanto, he would have been understandably cautious if not appalled that his government would allow its farmers to be undermined by an American company. In fact the government has shifted blame to the farmers whenever large crop failures occur saying that they are using pesticides improperly. To understand how and why the government of India would allow Mahyco, a subsidiary of Monsanto, to operate in India, we must look into India’s past, starting with the famines that laid waste to the nation shortly after partition, then study the Green Revolution, and then the slow erosion of land rights through The Land acquisition Act, and the co-opting of farmers seed rights through Indian Seed Patent Act and Seed Bill of 2004. This is the subject of other articles on this blog. You can research the legislation through the links on the sidebar entitled Acts and Legislation. This subject will be covered more in depth in subsequent posts. However, there is a need to go over the basic world history and political beginnings of what has been called the “Green Revolution,” in order to put Rajeshs’ situation into context. In 1961 India was teetering near the edge of mass famine. In the United States the Kennedy Administration approved the use of chemicals, those we now know included dioxin, to destroy vegetation in Vietnam. The chief producers of this chemical was Monsanto and Dow Chemical. Around this same time, in Mexico a high yielding wheat variety was growing with the aid of mechanized agriculture technologies and fertilizers. This wheat was part of a political maneuver to control the worlds foods supply under the auspices of “feeding the poor of the world,” and it’s success was about to change the future of India’s food sovereignty to present day. In order to disconnect national sovereighnty largely based on a nations ability to feed and clothe its own people without third party intervention, artificial scarcity was sold en mass. 1961 was the beginning of the “Green Revolution” in India. The Green Revolution opened the doors for the market transition of war chemicals into agricultural chemicals, such as Round Up(Glyphosate) and then thirty years later, genetically engineered crops. Prior to the 1960s, The U.S. had begun funding “re-education” campaigns for shifting India’s native seed varieties to those same varieties being tested in Mexico under sponsorship of U.S. special interest groups. The Rockefeller Foundation and five U.S. land grant universities provided monetary and infrastructural assistance to Indian agricultural universities and research institutions and suggested curricula appropriate to educating scholars and farmers to meet the challenge of introducing high yielding varieties of rice and wheat. Thus the donor country is and was responsible for the philosophical and value system transition of India’s traditional farming practices. To sale high yielding varieties of wheat, the foundation had to creatively play with the famine fears of the Indian people to get enough government officials to buy in to artificial scarcity. Present Day, Monsanto, Carghil, ADM, and Dupont among others are following the the successes of the “reorientation” campaigns funded by the Rockefeller Foundation to launch new products. Motive is hidden in plain sight. There are more than 20,000 documented varieties of rice on the Indian subcontinent. There are about 3000 varieties of rice in Uttarakhand itself. There are countless varieties of desi wheat. The Green Revolution narrowed down these varieties to 8. The interdependent network, from microorganisms to beetles to birds, that thrived with the cultivation of 20,000 various rice varieties, in a few years entered into what activist and writer Rachel Carson, coined as “Silent Spring.” The tragic byproduct of the Green Revolution, was loss of biodiversity, because of either ignorance or malice of a few powerful organizations. Wallace traveled around Mexico meeting with farmers and officials. “In his view, it was not land reform and small scale family farming what Mexico’s peasantry needed in order to fight hunger and poverty, but the industrialization of agricultural production. “Wallace unabashedly saw gringo know-how as the salvation of Mexico’s rural poor”, according to journalist Bill Weinberg in his book Homage to Chiapas (Verso Books, 2000). “It was Henry A. Wallace, more than any other man, who opened Mexico to the agribusiness model. In other words, Wallace’s views on Mexico’s agriculture and rural poverty were completely opposite to those of Cardenas’ and completely in sync with Avila-Camacho’s conservative politics. Once installed as vice president in early 1941, Wallace met with Rockefeller Foundation president Raymond Fosdick. “If the Rockefeller Foundation would undertake to help the Mexican people increase the yield per acre of corn and beans”, he told Fosdick. “it would mean more to the future of Mexico than anything else that government or philanthropy could devise.” Thus the Mexican Agricultural Program (MAP) was born. MAPS was staffed with both U.S. and Mexican scientists, focusing on soil development, maize and wheat production, and plant pathology.” (Wikipedia). The Office of Special Studies in Mexico became an informal international research institution in 1959. In July 1944, Norman Borlaug flew to Mexico City to head a new forming program as a geneticist and plant pathologist. “NEW DELHI: Long before Mr Bush and Dr Rice came by to leapfrog US-India ties to a new level, it was Prof. Wheat who jump-started and nourished the relationship. Norman Borlaug, the genial scientist-pacifist who died of cancer in Dallas on Saturday, was as much India’s ‘annadaata’ as he was the Father of the Green Revolution. Around the time Dr Borlaug arrived on the scene in the mid-1960s, the specter of famine, shortages, and starvation hung over the sub-continent. India was importing huge quantities of food grains from the US – much of it dole – to feed its growing millions in a manner that was famously described as “ship-to-mouth” sustenance. 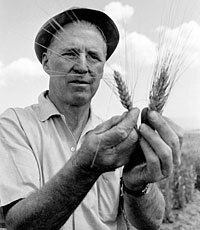 Norman Borlaug, a strapping, self-made, American from the farmland of Iowa, spent ten years in Mexico creating a wheat strain containing an unusual gene. This wheat was a shorter and had a compact stalk that could support a large top of grain without falling over from the weight. 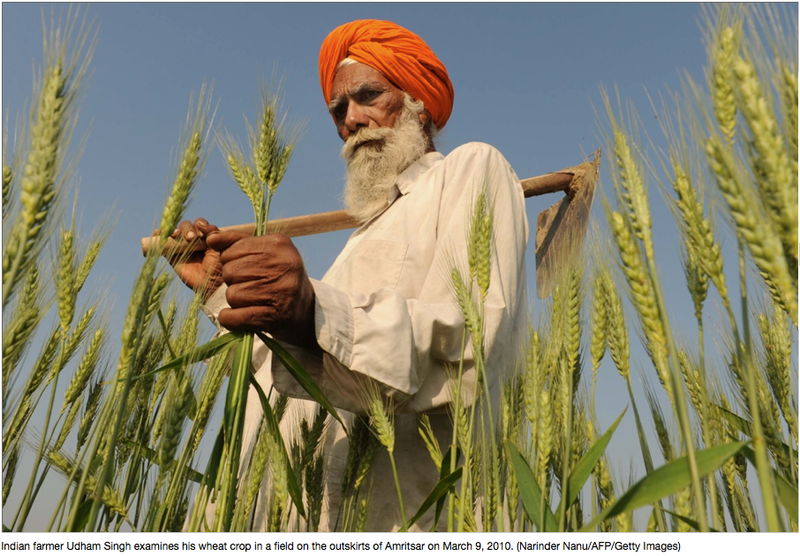 It quadrupled India’s wheat output. A new variety of rice, labeled IR8 that produced more grain per plant when grown with irrigation and fertilizers was developed during this time, and is till in use in fields throughout Asia. Both this rice variety and the wheat “designed” during this time are considered a HYV, a high-yield-variety that is dependent on fertilizers. Increased food output using the same amount of inputs as before is generally seen as a major achievement. Producing dwarf wheat required more fertilizer and was implemented in mono cropping. The dwarf wheat is generally seen as a success as it increased wheat production in many nations, but in doing so, there was a caveat. It made them reliant upon more inputs, changed biodiversity, and put agribusiness and not the farmer in charge of feeding the nation. Though Borlaugs intent was good, a chain reaction was set off that led to greater acceptance of new foreign technologies (including genetically engineered crops) largely because of relationships and political agreements established with agribusiness during the Green Revolution. You might remember that a few paragraphs above I mentioned that Punjab India was selected by the Indian government to test Borlaug’s wheat and rice varies because it had an ample water supply and agricultural success. Punjab also has a great concentration of farmers. ALL OF THAT HAS CHANGED. The byproduct of introducing monocrops of wheat and rice, which required more irrigation and chemical fertilizers and peptides is that within less than 15 years Punjab’s water table fell to dangerous levels. The situation is so drastic now that it is estimated without major changes to agriculture in that area, the ground water will disappear in 25 years. “This trend of excessive groundwater drafting for agriculture has led to water tables dropping at an alarming rate; 79 percent of the groundwater assessment divisions (“blocks”) in the State are now considered ‘overexploited’ and ‘critical’ with extraction exceeding the supply. From 1982-87, the water table in Central Punjab was falling an average of 18 cm per year. That rate of decline accelerated to 42 cm per year from 1997-2002, and to a staggering 75 cm during 2002-06. Water tables are now falling over about 90 percent of the state, with Central Punjab most severely affected. As part of the Green Revolution push for higher yields and more production of staple crops, both state and federal governments in India have for years heavily subsidized electricity to farmers for irrigation pumping. As a result, electricity consumption by farmers has also increased steadily over the years, as more and more energy is required to pump water from ever-deeper depths. To understand why increasing yield, and increasing inputs to support that yield has deeper implications for the long term success of a given crop its important to understand how productivity is measured. For one explanation I turn to the creators of NatuEco farming in village Bajwada, district Dewas, Madhya Pradesh India. We define productivity of a farm (called ‘Visible Productivity’) as drymass/ per hectare which is a combined effect of ‘Primary Productivity’ and ‘Secondary Productivity’.’ Primary Productivity’ by definition is the productive efficiency of land without any external input while ‘Secondary Productivity’ is defined as the incremental productivity achieved over and above the primary because of external inputs like water(brought in from outside), fertilizers, pesticides, transportation etc. Secondary therefore is a multiplier of the primary. How do we measure Primary Productivity? ‘Primary Productivity’ is measured in terms of output efficiency (dry mass/ per hectare/KL of water consumed) while ‘Visible Productivity’ is measured in terms of gross output. (dry mass/per hectare). Hence it is very much possible that while ‘Visible Productivity’ seems to be going up, the underlying ‘Primary Productivity’ is going down sharply. What is wrong in the existing system? So far all our efforts have been to increase the ‘Visible Productivity’ by enhancing the ‘Secondary Productivity’ which in itself is perfectly sensible thing to do. We have so far got phenomenal results indeed. In fact the so called ‘Green Revolution’ has been all about increasing our ‘Visible Productivity’ through enhancing ‘Secondary Productivity’. Example of Punjab is the most glaring case of what we are talking. The enhanced ‘Secondary Productivity’ has given us a false sense of pride that ‘Visible Productivity’ is up. However, the reality was that the ‘Primary Productivity’ had been steadily going down all these years and we were unaware because our focus was just measuring the ‘Visible Productivity’. The chemical fertilizers commonly used for these types of varieties are called “NPK”, or Nitrogen, Phosphorus and Potassium. This mix of nutrients, focuses on energy and protein production necessary for cell growth. All plants take what they need, only when they need it. The leftovers of excess nutrients and additives from the fertilizers, create salt, arsenic, and nitrates all of which leech into the ground water. Consequently, the Punjab-Harayana area has high levels of contamination in lower and lower levels of groundwater. Plants convert nitrogen to make proteins essential to new cell growth. An abundance of nitrogen, however, will make the plant weak and soft. Potassium, which is responsible for the manufacture and movement of sugars and starches, as well as cell division is locked out by high salinity is the soil which is a by-product of using chemical fertilizers. Consider that plants are “accumulators”, and “hyperaccumulators”. The root system pulls nutrients from water into its stem, leaves, and flowers. Some nutrients are used to convert some things to other things, and no longer remain, but there are micronutrients that remain in the over all cellular “skeletal” structure and fluid of the plant. Plants, like the human body also require, calcium, magnesium, sulfur, iron, manganese, zinc, copper, boron and a few other trace minerals to be healthy. In nature they receive these elements from soil that is built from decomposition of things that have these minerals inside of them. Nothing is wasted. If these minerals are not there, in the case of monocropped heavy chemically treated soils, not only will the plant be lacking in vital nutritional content containing minerals, it will also like vitality, ojas. When groundwater is contaminated with heavy metals, by-products of the petrochemical and agrichemical industry, the contamination also ends up in the body of the vegetable. It will therefore not only have less taste (rasa), but less nutrition, and be susceptible to infestation, thereby requiring pesticides to protect the weak plants. It is not only the weak plants that attract pests, but the lack of competition. By having this increased crop homogeneity there are less predators to fight off pests. Thus one giant field, stripped of its biodiverse checks and balances, is a dying beacon for pests, and pesticides are used where before none, or only those organic in nature, were used. Because of the Green Revolution, the infrastructure around farms changed. Irrigation channels now brought water into fields that traditionally relied only on monsoon rains. Then to avoid the complication of nutrients spilling into these monocropped fields from overflow of rivers during the monsoon season, large embankments were constructed! When a field that is normally dry and fallow is irrigated, there are several stages of evaporation before the water reaches the plant. Evaporation happens before the water reaches the trench. Evaporation happens as water flows and stands in the trench, especially in continuous heat. Trenches are generally not shaded. Only a small percentage of the water makes it to the plants. Then the water that does soak back into the ground is full of fertilizer wastes. Because of an increased demand for water, large dams were built. The reservoirs of the dams displaced village farmland, and in certain areas, the downriver side of the dam changed the entire survival pattern, subsistence lifestyles, and habitat of both people and animals. The pairing of seed and fertilizer since the Green Revolution has shifted the agricultural practices in India dramatically from independent to dependent, as new seeds and denatured soil requires fertilizers to grow crops, and the weakened plants require pesticides to protect them. “The pseudo revolution affected the hills (in India) too and production declined. Although production increased in the plains with the coming of the Green Revolution, this increase was a flash in the pan, as result of magical hybrid seeds and chemical fertilizers introduced. Chemical fertilizers squeezed the natural fertility of the Indian soils like a lemon, snatched the traditionally developed and saved seeds from the farmers, and also dealt the traditional knowledge system of Indian farmers a deathly blow. In the 1960s and 1970s, farmers were given free mini kits of hybrid seeds and chemical fertilizers by agriculture extension officials. Soon enough, many switched over to these and abandoned their old traditional seeds and organic manures. Chemical fertilizers did increase production initially. With government support and subsidy even the farmers of Uttarakhand took to these new ways. However, most farmers did not realize the hidden catch in the chemical farming in the beginning. Many sowed these hybrid seeds without manuring their fields, thinking that they would perform miracles year after year. But they were in for a rude shock when production plummeted immediately and their crops were attacked by diseases and pests. So why how did generations of subsistence farmers fall into this trap? It is by design. The story starts long ago and centers around re-orientation programs sponsored by generous donations from powerful foundations. The following is an excerpt from Lua Cheia’s manuscript: Engineering Reliance: Out of the Garden into the Boardroom. A man named Rockefeller and a man named Carnegie were very good friends and the most powerful men in America around the turn of the 20th century. They set up a tax exempt foundation called the Rockefeller Foundation and Carnegie Fund. These two organizations began pumping money into universities, insisting they do drug research. Rockefeller and Carnegie together financed the famous Flexner Report of 1910 written by Abraham Flexner, hired by Rockefeller and Carnegie. Flexner traveled all over the country and made a very scholarly analysis of how bad the level of medical education was in America. The medical schools at the time ranged in quality, and some were very bad. It was an emerging science with many opinions on how to emerge. Many schools relied on a combination of medicines, from traditional herbalists called ecclectists, to those who capitalized on opiate and cocaine based remedies, to regular medicine which used methods such as bloodletting. “Eclectic Medicine appeared as an extension of early American herbal medicine traditions, such as “Thomsonian medicine” in the early 19th century, and Native American medicine. Regular medicine at the time made extensive use of purges with calomel and other mercury-based remedies, as well as extensive bloodletting and Eclectic medicine was a direct reaction to those practices as well as the need to professionalize the Thomsonian medicine innovations. By the 1850s, several “regular” American doctors, especially from the New York Academy of Medicine, had begun using herbal salvesand other preparations. By the 1880 and 90s however, those medical facilities that did not pass the criteria of Rockefeller and Carnegie’s Flexner report, lost accreditation. Many schools closed, and other were consolidated. Those who were allopatic were offered tax-free grants. Millions and millions of dollars thus went to those medical schools that were cooperative and that were willing to go along with the recommendations made by Rockefeller and Carnegie. The money paid for new buildings and equipment, and those same schools are the in prominence in America today. A co-conspirator named Fred Gates and Flexner, and all those whom they appointed, became Board members and consultants for all of these schools. They helped shape the curriculum, climate and goals from then to present day allopathic medicine. Fred Gates changed Rockefellers mode of philanthropy. He helped him set up well-funded foundations that were run by experts who decided what topics of reform were relevant and profitable, actualizing Rockefellers idea that for every dollar given away in philanthropy you ought to be able to make at least a hundred back. The foundations operating as tax free entities would identify problems, (or create them) such as in the case of the medical schools, then provide the solution. When there was no problem, they would find one to solve. So an oil industrialist, Rockefeller, Gates a business person and Baptist minister, Carnegie, a steel industrialist and Abraham Flexnor and author and educator who before writing the Flexner report had never stopped foot in a medical school, steered the American population away from looking to the natural world to solve their ailments into drug dependent modern-day pharmaceutical profiteering. What qualified them to do this? Profits cannot be strained from a unexploited people who know how to heal themselves. Just like there is a limit to profits when people and communities provide for their own food requirements. To change this situation, the above mentioned industrialists had to create a climate of dependence, and that now exists between India’s farmers and the same multinationals who created a false problem to be solved. “In an earlier generation, the Rockefeller and Ford Foundations spent millions on putting Third World agronomists in training programs at American universities where they would become converts to the Green Revolution. They certainly understood that becoming converts for corporate farming was almost a guarantee for continued success in an academic world that was awash in money from the Monsantos of the world. In an article titled “The United States Intervention in Third World Policies” that appeared in the April 1986 Social Scientist, Jagannath Pathy drew attention to the massive seduction of academics by the Rockefeller and Ford Foundations. This involved sending our “experts” overseas to help the benighted peasants as well as recruiting theirs for special training at places like Cornell and MIT. Indo-U.S. co-operation in agricultural research dates back to the efforts of the U.S. government to help India increase food production. In 1953, F.W. Parker of the Technical Co-operative Mission arranged a number of studies determining the fertility status of soils. This laid the basis for the establishment of a chain of soil testing laboratories aided by USAID which subsequently paved the way for the introduction of chemical fertilizers in India. In 1955, Rockefeller Foundation and five U.S. land grant universities assisted Indian agricultural universities and research institutions and suggested a curricula appropriate to reorienting scholars to meet the challenge of introducing HYVs of maize, sorghum and millets. The U.S. gave $ 35 million for laboratory equipment and libraries. Every year 35 fellowships were instituted for training Indian students at U.S. institutions. Rockefellers provided $ 21.3 million up to 1973 and arranged for several visiting professors to visit India. It also provided travel grants for Indian government officials and university administrators to go to the U.S. In 1982, Ralph W. Cummings, the Director of Rockefeller Foundation’s Indian agricultural research programme laid down guidelines for the establishment and development of agricultural universities. These guidelines focussed on higher agricultural productivity through diffusion of fertiliser responsive varieties. The narrow genetic base of HYVs, disease and pest susceptibility of some of the parent varieties and the existence of vast monoculture soon exposed the crops to attacks by pests and diseases. As noted earlier, in the mid-1960s, USAID provided large loans to import much needed fertilisers. The U.S. and World Bank put pressure on the Indian government to encourage MNCs investment in local fertiliser production. Such a strategy could not have been pursued smoothly without the support of Indian agricultural scientists trained in the service of American interests (Abrol, 1983). From 1952-72, the Ford Foundation spent $ 16 million providing generous grants to persons, institutions and government on a wide variety of nation building activities. It established and/or funded the Institute of Economic Growth, Gokhale Institute of Politics and Economics, National Council of Applied Economic Research, Indian Statistical Institute and Institutes of Management at Calcutta and Ahmedabad. The Foundation trained about 50,000 extension workers. The National Institute of Community Development was established with the help of USAID and Michigan State University. “Because farming methods that depend heavily on chemical fertilizers do not maintain the soil’s natural fertility and because pesticides generate resistant pests, farmers need ever more fertilizers and pesticides just to achieve the same results. At the same time, those who profit from the increased use of fertilizers and pesticides fear labor organizing and use their new wealth to buy tractors and other machines, even though they are not required by the new seeds. This incremental shift leads to the industrialization of farming. Once on the path of industrial agriculture, farming costs more. It can be more profitable, of course, but only if the prices farmers get for their crops stay ahead of the costs of petrochemicals and machinery. Green Revolution proponents claim increases in net incomes from farms of all sizes once farmers adopt the more responsive seeds. But recent studies also show another trend: outlays for fertilizers and pesticides may be going up faster than yields, suggesting that Green Revolution farmers are now facing what U.S. farmers have experienced for decades-a cost-price squeeze. But if increased food production has been the principal thrust of the new strategy it has not been the only one. Closely tied to the effort to increase output has been the transformation of agrarian social and economic relations by integrating once isolated areas or farmers into the capitalist market system. This “modernization” of the countryside, which has been an important part of so-called nation-building throughout the postwar period, has been facilitated by the dependency of the new technology on manufactured inputs. These development experts, however, apparently feel that widening the market by pushing new inputs is not always enough. Along with their recent admiration for the “progressive” peasant who jumps at any opportunity to grow more, they have been making an effort to teach personal gain and consumerism. In his widely read handbook, Getting Agriculture Moving, ADC president Arthur T. Mosher insists on the theme of teaching peasants to want more for themselves, to abandon collective habits, and to get on with the “business” of farming. Mosher goes so far as to advocate extension educational programs for women and youth clubs to create more demand for store-bought goods. The “affection of husbands and fathers for their families” will make them responsive to these desires and drive them to work harder. The planned obsolescence of the Green Revolution has created a false crisis point just like before. In this global play, including all the prior actors, using the same script that says India is once again in trouble and cannot produce enough food to feed her people. Now a new industry, the biotehcnology industry, has emerged with the solution to declining Visible Production. Scores of young Indians are sent to schools to become doctors, and engineers, those of which are sent to schools with funding and assistance by the largest biotech and western pharmaceutical industry players in America. Sounds familiar? History repeats itself. This time however, there is a third input for Indian farmers to buy: Patented-genetically modified seeds. How do they position themselves for such rapid growth? They exert control over State Governments, Agriculture Universities and Institutions, and rural youth, farmers and villagers. They use the “problems” created and identified by tax extempt foundations, then step in as the 21st century saviors from starvation. They use their influence, having ex board members in top political positions in the U.S. government, to change policy. (This is a whole separate other post). The Indian government readily colonizes itself under foreign interest who push their interests through bribes and investment. 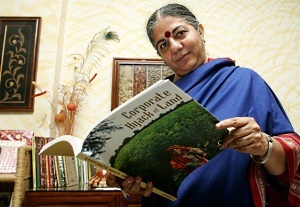 Dr. Vandana Shiva is an activist, writer, seed saver and founder of Navdanya in Dehradun India. Navdanya is a network of seed keepers and organic producers spread across 16 states in India. It has its 54 seed banks. “We are at this watershed of human evolution. We will either continue to walk on the path of resource waste, resource monopoly and therefore resource conflict and have no workable societies or we will make a transition to resource prudence, conservation, equity sharing and peace. If we don’t change the path there is no survival for the human species. The root causes of the current food prices are two fold: The first is the model of industrial farming which pretends to produce more while in reality it produces less. And the reality is eclipsed by not seeing what a piece of land can produce in terms of biodiversity, nutrition, local food sustainability and focusing only on the commodity tradee….So yes we have more corn and soy in the world….but the more corn and soya in the world the more hunger. The first Green Revolution didn’t solve food problems it created. It left impoverished farmers…it reduced our ability to produce proteins and pulses by promoting monocultures of rice and wheat and in India and corn in Mexico. The beans disappeared the pulses disappeared the nutrition disappeared out of the food system. The chemicals appeared but the nutrition disappeared. It s also wrong to claim that genetic engineering will solve the food crisis “introducing more toxin in the plant does not increase the yield of food, it increases yield of toxins. The technology itself is not capable of increasing yield at this point because yield is a multi genetic trait. Many genes have to interact together to increase the yield. And that is why only toxins are being moved around. Genetic engineering is based on a false reductionist science. Navdanya biodiverse small farms produce 5 times more than the monocultures. Seed has been a farmers resource. It has been a common property. They have been freely saved and exchanged. When a company like Monsanto enters the seed supply system it does three things. It makes sure that all seeds of the farmer are destroyed either by giving incentives to farmer to give them the old seed or by basically making the farmer believe the new seeds will bring miracles. The second thing the company does when it enters any country or region is in face erode the public supply, and undermine public research. The third thing the company does is do aggressive advertising as if it is bombing a zone and if you go to “parts of India where farmers are committing suicide you watch the billboards you watch the an videos they use gods as seeds. I have seen (ads with the) god Hanuman bringing Monsanto seeds. Guru Nanak the founder of the Sikh religion selling Roundup. When a peasant in a simple society who has never had any sense of how these corporations function is brought a god around who his entire faith is organized, he tries first that faith to these new seeds and gets into the dependence without knowing its about the corporation (and their intent. Folk please excuse any spelling and grammar errors in this post. I will revise. If you have any suggestions please contact me @ actnaturallyworldwide@gmail.com This is the end of this post of the Green Revolution. Next Post, Who EXACTLY is Monsanto? I wanted to include an article from 2008 which speaks to the farmer suicides mentioned at the beginning of this post. 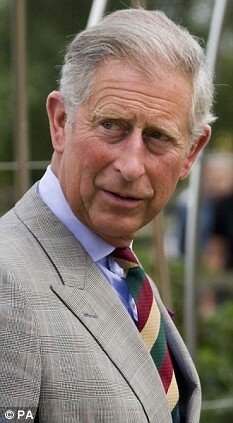 When Prince Charles claimed thousands of Indian farmers were killing themselves after using GM crops, he was branded a scaremonger. In fact, as this chilling dispatch reveals, it’s even WORSE than he feared. The children were inconsolable. Mute with shock and fighting back tears, they huddled beside their mother as friends and neighbours prepared their father’s body for cremation on a blazing bonfire built on the cracked, barren fields near their home. As flames consumed the corpse, Ganjanan, 12, and Kalpana, 14, faced a grim future. While Shankara Mandaukar had hoped his son and daughter would have a better life under India’s economic boom, they now face working as slave labour for a few pence a day. Landless and homeless, they will be the lowest of the low. Unable to pay back the equivalent of two years’ earnings, he was in despair. He could see no way out. There were still marks in the dust where he had writhed in agony. Other villagers looked on – they knew from experience that any intervention was pointless – as he lay doubled up on the ground, crying out in pain and vomiting. As neighbours gathered to pray outside the family home, Nirmala Mandaukar, 50, told how she rushed back from the fields to find her husband dead. ‘He was a loving and caring man,’ she said, weeping quietly. Shankara’s crop had failed – twice. Of course, famine and pestilence are part of India’s ancient story. Beguiled by the promise of future riches, he borrowed money in order to buy the GM seeds. But when the harvests failed, he was left with spiralling debts – and no income. The crisis, branded the ‘GM Genocide’ by campaigners, was highlighted recently when Prince Charles claimed that the issue of GM had become a ‘global moral question’ – and the time had come to end its unstoppable march. Speaking by video link to a conference in the Indian capital, Delhi, he infuriated bio-tech leaders and some politicians by condemning ‘the truly appalling and tragic rate of small farmer suicides in India, stemming… from the failure of many GM crop varieties’. The rest of the world, they insist, should embrace ‘the future’ and follow suit. So who is telling the truth? To find out, I travelled to the ‘suicide belt’ in Maharashtra state. What I found was deeply disturbing – and has profound implications for countries, including Britain, debating whether to allow the planting of seeds manipulated by scientists to circumvent the laws of nature. Simple, rural people, they are dying slow, agonising deaths. Most swallow insecticide – a pricey substance they were promised they would not need when they were coerced into growing expensive GM crops. Pro-GM experts claim that it is rural poverty, alcoholism, drought and ‘agrarian distress’ that is the real reason for the horrific toll. In one small village I visited, 18 farmers had committed suicide after being sucked into GM debts. In some cases, women have taken over farms from their dead husbands – only to kill themselves as well. Latta Ramesh, 38, drank insecticide after her crops failed – two years after her husband disappeared when the GM debts became too much. She left her ten-year-old son, Rashan, in the care of relatives. ‘He cries when he thinks of his mother,’ said the dead woman’s aunt, sitting listlessly in shade near the fields. But GM salesmen and government officials had promised farmers that these were ‘magic seeds’ – with better crops that would be free from parasites and insects. But while cities such as Mumbai and Delhi have boomed, the farmers’ lives have slid back into the dark ages. Though areas of India planted with GM seeds have doubled in two years – up to 17 million acres – many famers have found there is a terrible price to be paid. Far from being ‘magic seeds’, GM pest-proof ‘breeds’ of cotton have been devastated by bollworms, a voracious parasite. But with GM seeds they cannot do this. 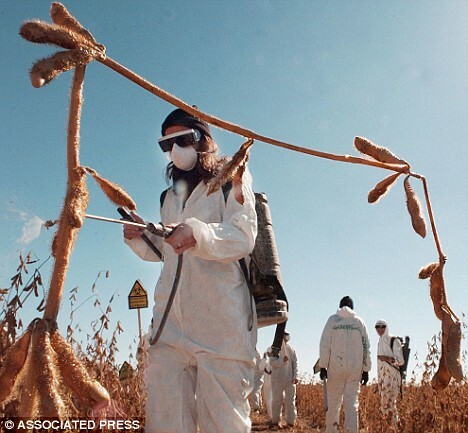 That’s because GM seeds contain so- called ‘terminator technology’, meaning that they have been genetically modified so that the resulting crops do not produce viable seeds of their own. As night fell after the ceremony, and neighbours squatted outside while sacred cows were brought in from the fields, his family had no doubt that their troubles stemmed from the moment they were encouraged to buy BT Cotton, a geneticallymodified plant created by Monsanto. Asked if the dead man was a ‘drunkard’ or suffered from other ‘social problems’, as alleged by pro-GM officials, the quiet, dignified gathering erupted in anger. ‘No! No!’ one of the dead man’s brothers exclaimed. ‘Suresh was a good man. He sent his children to school and paid his taxes. Monsanto has admitted that soaring debt was a ‘factor in this tragedy’. But pointing out that cotton production had doubled in the past seven years, a spokesman added that there are other reasons for the recent crisis, such as ‘untimely rain’ or drought, and pointed out that suicides have always been part of rural Indian life. Officials also point to surveys saying the majority of Indian farmers want GM seeds – no doubt encouraged to do so by aggressive marketing tactics. During the course of my inquiries in Maharastra, I encountered three ‘independent’ surveyors scouring villages for information about suicides. They insisted that GM seeds were only 50 per cent more expensive – and then later admitted the difference was 1,000 per cent. India’s farmers are also starting to fight back. As well as taking GM seed distributors hostage and staging mass protests, one state government is taking legal action against Monsanto for the exorbitant costs of GM seeds. But the debt does not die with her husband: unless she can find a way of paying it off, she will not be able to afford the children’s schooling. They will lose their land, joining the hordes seen begging in their thousands by the roadside throughout this vast, chaotic country. Cruelly, it’s the young who are suffering most from the ‘GM Genocide’ – the very generation supposed to be lifted out of a life of hardship and misery by these ‘magic seeds’.